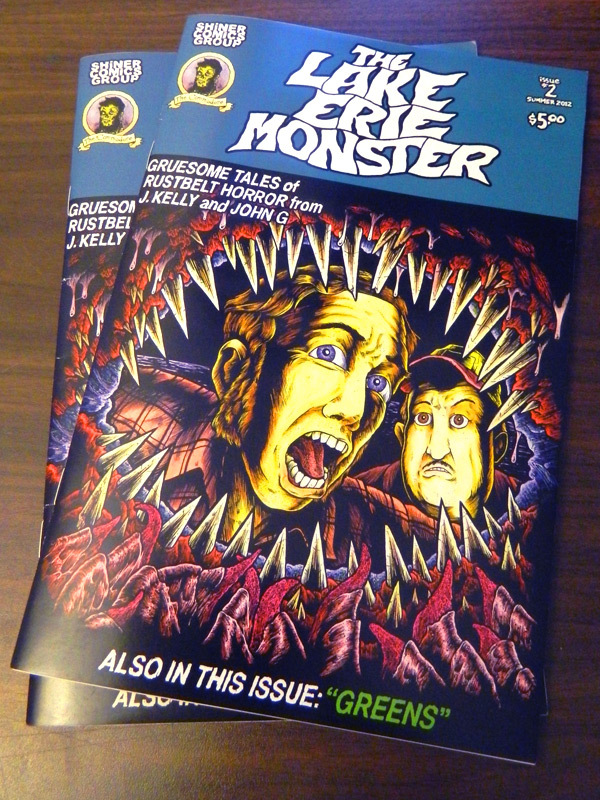 The Lake Erie Monster #2 is NOW AVAILABLE all over the Cleveland area! Our retailers are listed on the Buy The Comic page (and as of this posting all but Comic Heaven in Willoughby have it). Plus, we’ve added one of our new advertisers, Joy Machines bike shop on West 25th, to the ranks of retailers selling the comic. Please support these retailers! They are all locally owned small businesses and are really really awesome at what they do. If you are not from Cleveland, The Lake Erie Monster #2 is also available for mail order in the Shiner Comics Store. The print edition of The Lake Erie Monster #1 is SOLD OUT, but the digital version is only ONE DOLLAR. It’s the same exact comic, only as a pdf file you can read on any computer or tablet. Big Thanks to our friends at Blue Arrow Records, DJ John Neely, and everybody that came to the release party for The Lake Erie Monster #2! We had a blast again, and it was fun meeting some new friends and hanging out with everybody!